Seventy years ago today, my mother was born. Thirteen years ago this week, and then again three years later this same week, my daughters were born. I grew up an hour north of Boston. Some of my earliest memories recall family trips into the city. Frigid December visits to see the Christmas-decorated windows at Filene’s and the lit-up trees on the Common. Muggy August afternoons at Fenway Park to see the Red Sox, the team I worshipped. For 22 years after returning from college, I lived or worked in the place that I will forever consider my hometown. I’m sharing this personal history because that is what Boston is all about: history. It’s what we’re best at. Maybe it speaks to our metropolitan inferiority complex, living in the shadow of New York and often forgotten as a major American city. Boston is like the nerdy kid with glasses in your fifth-grade class. Not as athletic as New York (and its 27 World Series titles), not as hip as Los Angeles. We trumpet our many world-class universities and hospitals the same way the nerdy kid recites all the presidents in order. Another reason we celebrate the past is that it reminds us of a time when Boston was more important. It was the first major city in the United States, and the largest until Philadelphia surpassed it in the mid-1700s. The American Revolution began here, of course, 238 years ago this week. It is home to America’s oldest public school, oldest university, oldest subway, and oldest major-league ballpark. Even the city’s only acceptable nickname* — “the Hub” — comes from an 1858 Oliver Wendell Holmes book referring to Boston as the “Hub of the Solar System.” There’s a mix of self-consciousness and wistfulness when we use that sobriquet. But there’s another reason that history is so important here. 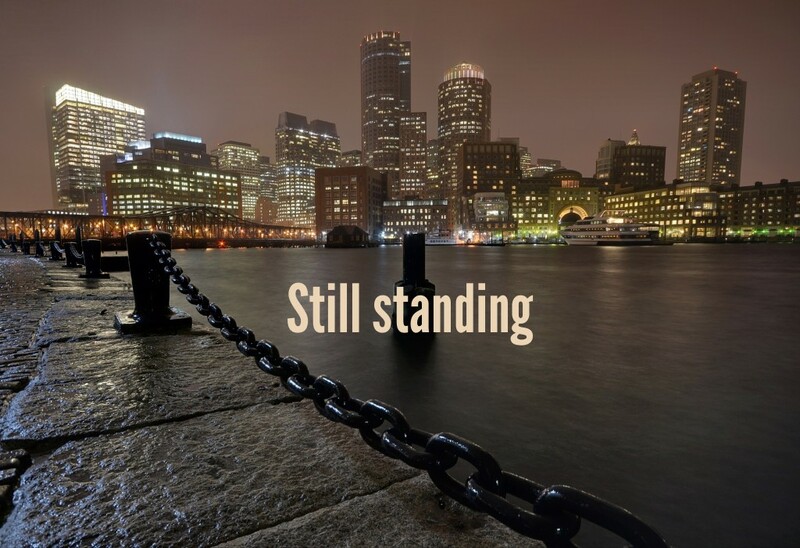 More than anything else, Boston endures. It’s a trait we inherited from the Puritans who settled here. Boston endures endless winters of chilly grayness and frustrating seasons of baseball ineptitude. Boston endures indicted House speakers and derided presidential candidates. Aggressive drivers and countless struggles with the eighteenth letter of the alphabet. And Boston will endure the Patriots’ Day tragedy, an attack on another of its many historical institutions: the world’s oldest annual marathon. Bostonians will forget their differences and roll up their sleeves and work together to clean up and rebuild. Bostonians will pursue the cowardly perpetrators with New England ingenuity and industriousness. And most of all, Bostonians will remember, and will take this new Boston Massacre and weave it into the 400-year-old tapestry of the city’s history.